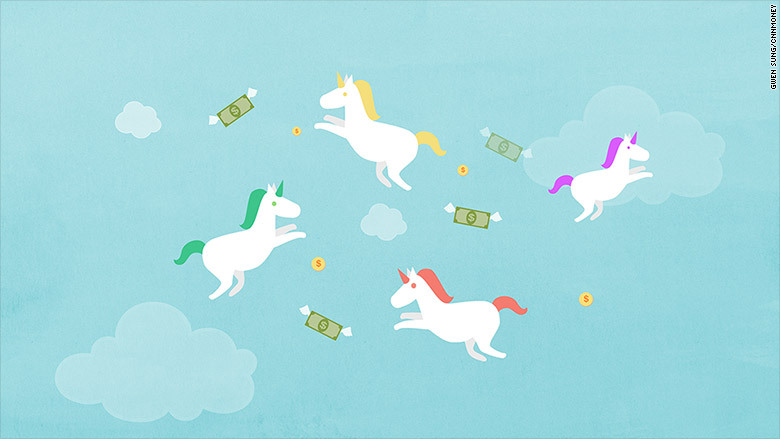 When it comes to unicorns, the rich are getting richer -- and that's not great for young startups. Unicorns, or privately held companies valued at $1 billion or more, are continuing to raise large amounts of funding from investors. In the second quarter of 2016, 39% of the capital invested into U.S. startups was pocketed by unicorn companies like Uber, Snapchat, Pinterest and Slack. That's a record $8.78 billion, a 216% increase from the same quarter in 2015. The data comes from a new report that PitchBook released on Thursday. It reveals that the number of early-stage deals also hit a low point. Just 525 deals were completed last quarter, down 38% from the same period in 2015. In the second quarter of this year, venture capitalists in the U.S. poured $22.3 billion into more than 1,900 deals. The amount of funding is up by 11% as companies stay private longer and command more and more funding. Fewer companies are getting funded, however. With a swelling number of unicorn companies and very few tech IPOs in 2015, investors warned companies that the funding environment was headed for a severe downturn. There was a lot of talk about startups needing to hunker down, raise a war chest and prepare for funding to dry up. But there are still plenty of opportunities for hot unicorns to continue raising capital, as evidenced with Uber and Snapchat. "Investors want that exposure to that high risk, high reward potential in their portfolios," said PitchBook's Garett Black, who authored the report. But increased capital to late-stage companies also "affect[s] the first institutional money going into companies." Investors and analysts aren't concerned about what this means for early-stage innovation just yet. "The market has tightened up," said Ben Luntz, managing partner at early-stage fund Indicator Ventures. "But it's not like the Armageddon that people were talking about." Luntz added that companies with sound fundamentals and innovative ideas likely won't have any problems getting funded. "Fewer companies are getting funded, but capital remains abundant. Those that can demonstrate robust metrics are still able to command hefty funding rounds," he added. That's backed up by the data. The median VC early-stage deal hit $5.5 million in the first half of 2016, the highest figure this decade. Black tended to agree that innovation shouldn't be stifled even as fewer startups raise money. "People are still incentivized to start companies," he said. But he added that as later-stage startups take a larger share of the funding, young companies could run into a capital crunch when they try to raise rounds in coming years. So far this year, just 1.2% of startups with seed deals -- or the first round of funding -- were able to successfully close their Series A, or next round of funding. That's a 15% drop from 2014.